As promised, here’s a tutorial showing you how Jesse and I got our drawings onto ceramics last month, creating two dinner services for the Rooms on View show. You can take a look at my finished plates here and see Jesse’s here. Getting transfers made was much easier than I might have thought. Just find screenprinters who will print in vitrifying ink on transfer paper, give them your positive, choose colours, and then pick up your stack of transfers. Jesse and I used JT McMasters in Cape Town, who were brilliant. If you’re very DIY, you can also screenprint your own transfers, as long as you can get hold of the right ink and paper. Using my sharp knife, I carefully cut the images from each transfer sheet, going fairly close to the edges of the images, but not so close that the image became spidery and unwieldy. Then I grouped the cut images in old avocado punnets. I was working in three colours with loads of different images, so it was important to keep some order. This was a fun bit, but also quite overwhelming, as there are so many different designs you can put together with all those cut transfers. I found that using the same image (or a slight variation) in three colours gave a fantastic range. I just messed around, placing the cut outs on plates, and when I was happy with a layout, I photographed it using my mobile phone camera. This was a great way to keep a record of a layout, as everything must be removed from the plate for the next step. Put the transfers into some water, and keep tweezers handy to get them out again (I used my fingers and they got irritated after a while). It doesn’t take long for the transfer to loosen from the backing paper. In fact, it’s important that they don’t soak too long, or they’ll lose their backing glue. Slide the transfer from the backing paper onto the plate. This is very exciting, because it looks fantastic straight away. The transfer is still pretty slippery at this stage, so it’s easy to slide around and place. However, don’t do too much sliding around, as you’ll lose the backing glue. It is important to remove all the water from the plate and get rid of any air or water bubbles behind the transfers. I used my fingers to smooth out wrinkles, then used a sponge to get rid of water. This is a bit of a tricky operation, and it’s very easy to shift the transfers at this stage. Pernickertiness is essential at this point. Leave the transfers to dry for a day. It will be hard leaving all your studio full of beautiful plates, I warn you! Now (and this is where Jesse and I almost came short), you need to find a friendly potter who will let you use their kiln. Tessa Blem Gawith in Muizenberg was kind enough to take us in when we had almost lost all hope! Here is her studio with her trusty assistant, David. 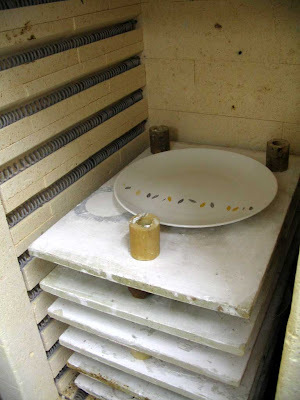 Plates get stacked inside a kiln, and are then fired to whatever temperature your transfers require. Ours required a temperature of 800 degrees Celcius. Step 9 – Ta dah! It’s magic! The plates come out of the kiln, cool down, and then they’re ready to eat off. I know there’s still lots to learn about ceramics transfers, and I’m looking forward to finding it out as I go along. Jesse and I are planning to do more for an exhibition at Curious, Whetstone & Frankley, opening in early July, so watch this space. Posted in Design, Making Friday and tagged Tutorial. Thanks for this! Who knew? I love seeing the process. Cicada sent me your link…I’ve been wondering how this was done. Thanks for the tutorial! Thank you, thank you, thank you it would have taken me another thousand years to finish my research and your pictures are much better than the ones I’ve come accross! wow. thank you so much for sharing! the plates are so beautiful, and the thought of creating my own is within reach. Thanks for posting this tutorial! Your plates look amazing! Thanks for sharing this! I will definetly be bookmarking this for future reference. 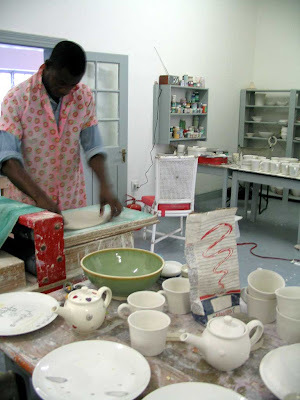 I live in South Africa, so my advice on where to find blank ceramics won’t apply to you. I just went to the Continental China factory shop, and then also to a local catering supplies shop. Next time round, I’m planning to collaborate with a potter and get ceramics custom-made though. Thanks for the tutorial. I’m new to screenprinting but I’ve been wondering about printing transfers. Yours look so good! I can’t wait to research and find the supplies and try it out. Oh m’goodness, Heather! These are FANTASTIC! So wonderful! Good for you!!! As a silkscreener myself, I’ve wondered about ceramic transfers so this is a great start! If I can get the right paper and ink I’d love to try this out! Woo-hoo! Congratulations, your work is gorgeous! Although this isn´t something one can try right away at home, it´s great to understand the process and actually see the “making of” images. Thanks! oh my gosh heather, you are so incredibly generous for sharing this information!! I have a friend with a kiln in the country and have always wanted to do a collaboration with him, but never knew how to do this! So interesting. Thanks!What an exciting process. I did it slightly differently: used scissors to cut out; didn’t take all the transfers off the plate before soaking, but soaked them one by one and applied them, leaving the dry ones in place (and marking the spot where the transfer had to go with a drop of water). Taking a photo would be a lot quicker! I slid them off the backing paper while still in the water – the transfers seem to be stronger than you think. beautifull work you have here! Great tutorial! I´m a ceramicist myself but I have never worked with transfers. I have been wanting to try it out though. Do you know what kind of ink and paper that is used for making the transfers? It would be fun to make them myself, but I´m not sure of what kind of materials to look for. thanks for so generously sharing such a well documented tutorial. Love it. Great tutorial! I use the same technique, only I screenprint the transfers myself. For me, applying the transfers to the ceramic surface is the hardest part. Especially when the ceramic surface has curvy shapes, I find it hard to completely get rid of air bubbles. And you only need a few of those to ruin your whole image… But as far as I can see, you don’t have that problem, because all your transfers look great! I’m very interested in this process as well! Your results are phenomenal!! Would you be so kind as to share your sources for inks and transfer paper? I love this idea!! Thanks so much! How exciting. They came out beautiful. They look amazing – I’ve always wondered how it was done… thanks for the tutorial! Thank you so much for sharing and for making such beautiful stuff – what an inspiration/revelation. It must have been so exciting seeing them all done! Oh how I love these! I would love to make my own, but I am pretty sure there is no way they could ever be this wonderful. While I don’t think you can upload directly to them you can mail them a disc with your art. The site says there is no extra charge for small runs. Now all I need to do is find a place to fire some plates! I keep marveling at this project. It’s so simple and so extra cool. If anyone in the Berkeley area tries this out, please contact me! Maybe we can go in together on supplies or kiln expenses. I am so glad you posted this in the summer. If I can get my act together, I can make plate sets happen for Christmas! thanks for sharing! i was wondering how you clever girls managed this. i’m really looking forward to trying this for myself. Thank you very much for the tutorial. It’s inspiring and very helpful! our plates just look amazing. and this tute was soooooo cool to read through. if i can find a potter with a kiln i’d love to try. what a great tutorial! thanks for posting. love your designs. are there any limitations on the plates that you have used? looks like they are porcelain? this is so inspiring! now to find a vitrifying ink screen printer…. How beautiful, and I had no idea that such a technique was available to me! I have a ton of old plates that could use some sprucing up. Is there any problem with using plates that are coloured, or were made in the ’60s? So kind of you! I have handpainted my designs on ceramics in the past, but how easy to do when you need to repeat. So generous of you. I have done ceramics since the early 80’s. I owned my own retail shop and fired decals on tiles for bathrooms and kitchens for local stores. There are lots of companies out there that make decals. Just type in decals, but make sure they are for ceramic pieces. I once did a party for Engelbert Humperdinck and we made coffee cups. sombrero hats that were chip and dip bowls and magnets and had our decals made and they were rather inexpensive. For those in the US, you can go here to have your stuff printed. Thanks for a wonderfull tut! Absolutely beautiful!! This is amazing! Definitely on my long term to do list now!! Heather – hello from London Town, where I was searching on the internet about ceramic transfers, and – ta dah – there you are, top ten in google. Lots of love, your work is looking fantastic! they looked gorgeous! thanks for the inspiration!! I always wondered how people did this so thanks, it looks so fun and easy but finding someone with a kiln to borrow would be a hard task for me! Does it feel bumpy like when you slide your finger across it? Your plates look great too! Pingback: Question: Printing on Ceramics?? That’s a great idea! I’ll list some of my transfers in my store soon. Please bug me if you don’t see them soon. This is really amazing!!! The easiest process for ceramic printing that I have come across till now. I’m really happy you shared this tutorial.. Going to try it very soon!! Where do you buy the transfer paper and which screen printers would you suggest in 2018 (i see this is an old post)? 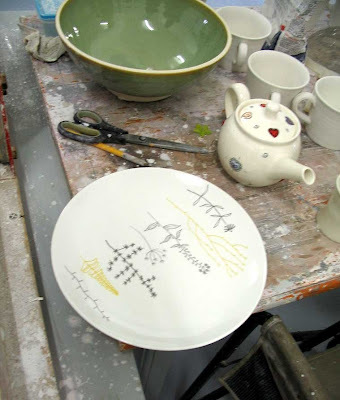 I gather that your transfers are placed onto glazed ceramics and then re-fired. Is this just a low temperature firing? I put this little magnet into my Etsy shop this morning. Check out how it likes to live dangerously, holding the youthful Nanook up above its beak like that! Crazy!